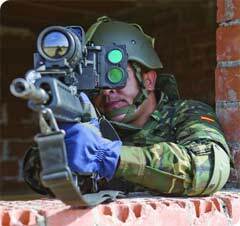 Spain push into soldier modernisation is through the (COMbatiente FUTuro, COMFUT) programme. It’s programme leader is a veteran infantry officer, Col. José Ramos Barrera, and collaborating closely with him is Angel Pérez Martín-Nieto, a former infantry officer who works as consultant for local firm NTGS, being appointed to act for the Ministry of defence Ministry of Defence’s Procurement Office (Dirección General de Armamento y Material) or DGAM to assists technically in order to drive modernisation forward. The programme was contracted for the design and development in October 2006. This was awarded to EADS Defence and Security with partners Indra Sistemas, Iturri, Amopack SL, Fedur and GMV. The scope of the design and development phase is very limited Martin-Nieto explains, producing only specific prototypes for a platoon sized unit. This phase is due to complete in 2009. When the design and development phase is completed the goal is to begin first phase production of COMFUT ensembles from 2010-12, initially covering 3000 systems with an in-service goal of mid 2011. This will be followed by Second Phase production, covering a further 6000 system. Under the current design and development phase, the EADS led team are responsible for delivering 36 prototypes. An initial 12 COMFUT systems were delivered at the end of 2007 for initial testing in 2008. Martin-Nieto explained, “In early 2009 they have to provide us with a specific system and then proceed with the validation phase for user trials and then produce a final report in December 2009.” He added through that there had been a six-month delay because of problems with the technology. 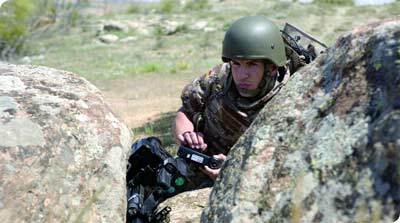 COMFUT has defined its overall capability in seven different subsystems; Armament, Power Supply, Sensors, C4I, Survivability/Protection, Sustainability and Preparation. The last comprises training, simulation and also vehicle integration to ensure that synergies with COMFUT specifically covering combat support, power supply and logistic support can be achieved effectively. The Power Supply subsystem covers both power source and power conditioning unit, which is being supplied by Amopack using battery technology that has been provided by Saft. Batteries on weapons are also rechargeable by fuel cell. While these batteries are different, they have the same connectors and charger as the main power supply subsystems and can also use fuel cells to recharge. The COMFUT programme has opted for the ITT SpearNet radio. A full data capability version, developed specifically for this programme which was delivered at the turn of year in preparation for trials using 12 systems in early 2009. The weapon and sensor system takes approximately 45 seconds to start-up after the BIT process, with the C4I module taking less than 60 seconds to provide communications and situational awareness.